Well, about 4:30 PM today I had had it at the house. Loaded up the car with pots and pans, the laundry bag and my art box. My thought was I'd really like to spend the day here in CiCI Blue tomorrow and maybe even...paint!!! Then loaded up the kids. I made enough room in the back so Lola could climb back there and lay down. The basket with the pots and pans were there too. Off we went!! Oh no, I had forgotten my cell phone. I took that quick u-turn and over went the pots and pans!! Clash, bang..and here is Lola now sitting beside me and on top of Ozzie's lap. She shook and shook. Home I drove to rearrange the pots and pans..my art box and Lola! Off we went again. Oh no...the phone. I reached down in that void between the seat and the console and felt..yes..the PHONE!! We are off and rolling. They settle down on the highway and nap til we get to the rest stop sign near our exit. I bet you didn't think dogs could read!! This is where we have lived for the past two months! These are new neighbors, Ruby and Craig. WE met them the other evening and their plan is to stay for a year or two. Then on our other side, new people. I have watched and those that do not hook up their sewer are just here for the night. Roger , Sammy and Ozzie walking ahead of us going back to our RV. 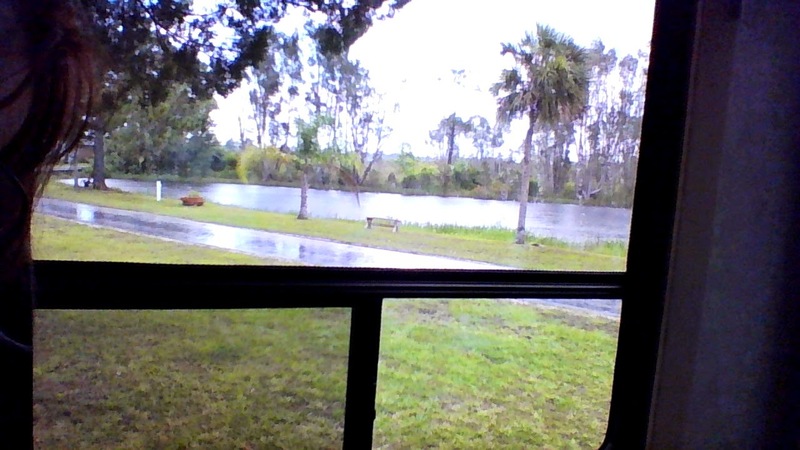 Crystal Lake RV Park is cozy. Directly off I 95 at exit 231. It hides behind Stuckey's. From what I've heard it gets packed when the snow birds return in October but right now it's lovely. Wendy, Her sister and brother run the park and it's always mowed and kept clean. Traffic on 95? We never hear it at night and during the day or at the dog park it's minimal. Between the interstate and the park the overgrowth of fauna really blocks the sound. Reasonable priced for overnight stays or month long. Swimming pool and laundry facilities and a beautiful view of the "Lake". It's small but so peaceful and pretty. This RV Park is also on Passport America for overnight camping. This is a view from our rig. Can't beat it! The Egrets are starting to come back to the Lake now and soon, oh lord, Lola will be greeting them full force. Just at dusk they sit in the trees across the lake and they are so pretty. I'll get pictures of them soon. Our walk to the dog park this evening went well. I stress. Sammy is so anxious so I am too. Talk about a couple.!! I started using his "big boy" collar. It has a bit of a sharper edge on the prongs. (I think he has a leather neck actually). Correction is a sharp tug and a verbal command and he's starting to get it. With Lola all I need to do is make a shh sound and she knows. Slower walk. Coming back we passed the new people staying for the night. They were outside sitting on their steps and for sure I was thinking Sammy would start to pull and bark. Well, proud Mum here, He did fantastic. I had the lead really short and he walked nicely by and now words were spoken by him.! lol Hello's back and forth and all was fine. They have a small dog and I was concerned but yeah..happiness tonight. I swear the only place that I'll feel comfortable with that boy is in the middle of no where where he can howl. I bought a dog whistle and soon I'll start training the kids with it. Lola would come running when I whistled out the back door at the house...now she can't hear it. My goal? One whistle, sit, two whistles, come. Let's see if I can accomplish this. Ok...dinner is ready so I'll end. See you tomorrow...with something painted because I stayed here or tales of shoveling!